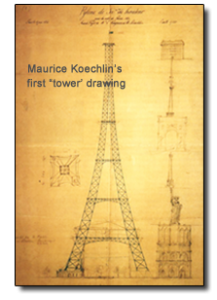 Although it’s called the “Eiffel” tower, it was designed in a very modest home studio, and engineered by an artist named Maurice Koechlin. Maurice got very little credit for his efforts but that didn’t stop him from submitting more designs. At first, Eiffel and his construction company were not impressed with the “outlandish” drawings—but that didn’t stop Maurice from submitting more designs. Frustrated and dissatisfied, Eiffel brought in an artist friend, Stephen Sauvestre, to add to the design. Although he was deeply offended, that didn’t stop Maurice from submitting more drawings. The magnitude of the project and the details of the construction were “jaw-dropping.” No one really believed that it could actually be built—but that didn’t stop Maurice from submitting more designs. Eiffel himself was severely criticized by respected artists and entrepreneurs—especially journalists, intellectuals, architects and city authorities for proceeding with Maurices’ “implausible” designs—but that didn’t stop him either. Still standing after 126 years, the Eiffel Tower is now considered one of the greatest engineered expressions of “art” ever constructed. That said, NOTHING should stop you from manifesting your vision. Happy Bastille Day!